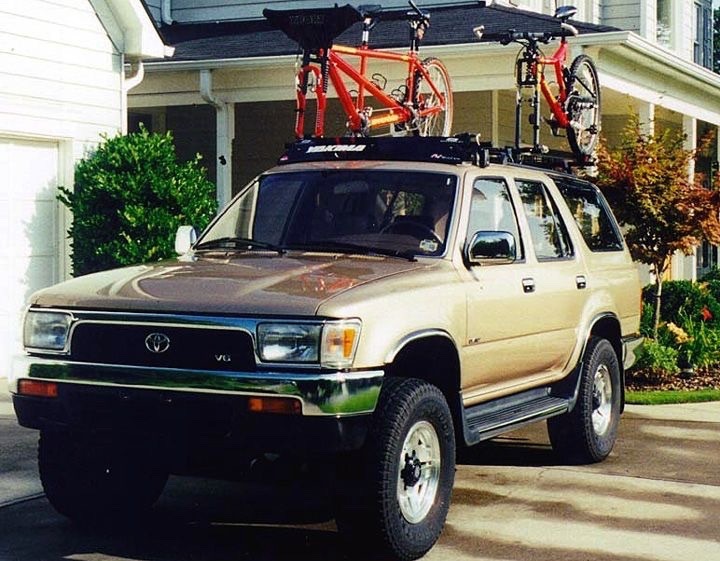 I bought my first Yakima Sport Rack system back in 1985 so I could carry my road and mountain bikes on top of the Brahma shell on my Mazda B2000. It was the basic Yakima tower system attached to some bolt-on pseudo gutter mounts that I attached to the roof of the plastic (but incredibly durable and light) Brahma shell using some strategically placed wooden supports in the ribs of the shell’s roof. Next up was our ’95 Toyota 4Runner. Gone were the rain gutters for the front cross-bar so I had to purchase the newer Q-Tower, designed to work on vehicles that didn’t have rain gutters. Well, at least for the front most rack. But, since we were hauling tandems, I also needed to buy a set of short towers that bolted to the factory roof rack. 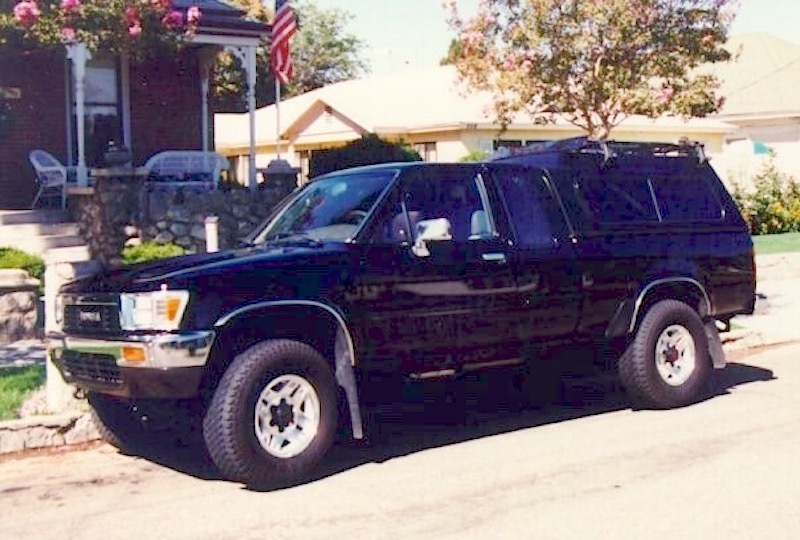 When the ’89 Toyota was replaced with our 1998 Suburban, once again I had to buy new Yakima towers that would work with the factory roof rack, 3 pairs worth. In fact, I believe I had to buy a new set of 10 lock cores to make all of this work. It suffices to say, we were heavily invested in Yakima hardware by this time. Thankfully, the 2002 Suburban that replaced the 1998 Suburban used the same luggage rack design at least on the mid-span so those mounts were carried forward and remained in use through 2006. 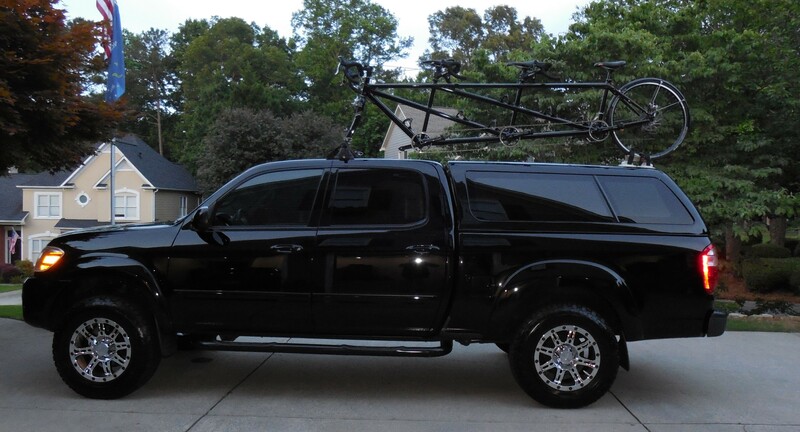 When the 2002 Suburban was replaced by the 2006 Tacoma, there was no longer any need to carry tandems or bikes on the roof; they all could fit inside the enclosed shell. Well, that was until 2012 when we added a triplet to the bicycle livery. With the Triplet, roof-topping was a requirement. Thankfully, the old Q-towers that I’d purchased for the ’95 4Runner’s front door racks could be used on the Tacoma with just the addition of the correct Q-Clip: a minor expense. However, for the rear wheel I opted to not install a roof rack system and, instead, found these nifty suction cup devices called “Sea Suckers” that were designed for use on boats that that also worked well on cars. After trading in the Tundra on the 2017 Tacoma I assumed a new set of Q-clips would be all I needed to move my Yakima front cross-bar from the Tundra to the Tacoma. Well, not really. 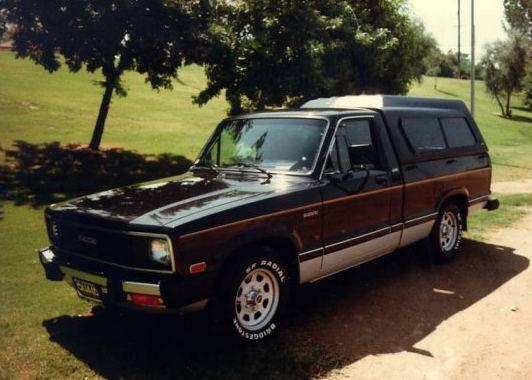 Even though the roof and door frame of the Tacoma looked just like the Tundra in terms of fit, finish and design the Yakima Q-Towers were no longer compatible with the newer, 3rd Generation Tacoma. I suspect it may have had something to do with the strength of the Tacoma’s roof, or the lack there-of. So, I’ve now had to order a new pair of Yakima’s Baseline towers along with the Tacoma Mounting Clip kit and a set of round bar adapters so that I can at least continue to use all of my remaining cross bars and the associated bike mounts. Well, I say that: quite frankly, I only need the one crossbar for the triplet so I’m thinking it’s time to sell off all of the now obsolete Yakima rack components. Yes, in keeping with my current push to rid the house and storage spaces of all unused, non-essential things I’m going to need to catalog and then put all of the various bike mounts, towers, crossbars, etc. out for sale. I will say, I though I still had a lot of the very old, original towers, bike mounts and what not up in the attic. But, apparently I sold the oldest racks back in 2001 after selling the ’89 Toyota truck and buying all new racks, bars, etc. for the Suburban’s. Six (6) Low Rider towers, which were installed on a couple Chevrolet K1500 Surburbans. Also a good fit on smaller European rails, as well as very large rails, Subaru Forester and Nissan Xterra, etc. Four (4) Copperhead, fork-style mount with fork block, locking skewer (3 of 4), a wheel tray with micro-adjusting, ratcheting wheel strap that fits a wide range of tire sizes and designs. Several 48″ and 48″ cross bars. This entry was posted in For Sale, Technology & Equip.. Bookmark the permalink. 1 Response to Et tu Yakima? More Designed Obsolescence or Just Keeping Up With Technology? A friend of mine calls it the Yakima tax on new vehicles.